The Coys! : Happy Birthday My Dear! On June 30th, Tyler turned the big 2-4!! 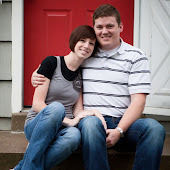 We celebrated in Centerville with his family on the 27th. I gave him his first present there. I made this mission collage for him. I watercolor-painted a map of the Dominican Republic and pin pointed the places he served. I put his missionary name tag in there and some pictures. The picture of the shoes were his mission shoes that he still has. I tried to find a Dominican flag, but couldn't, so I made a makeshift one and we'll put a real one in there someday. Tyler loved it, I think. At least he better cuz I spent a lot of time and money on it. It was really fun to make actually and I think it's a good way to display his mission. 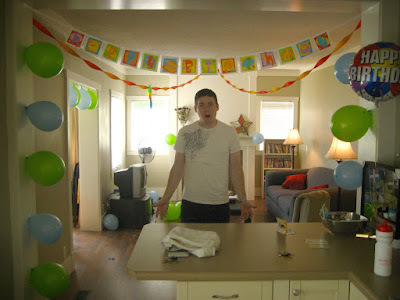 On Tyler's real birthday he worked his first job, which gave me a chance to decorate the house and make a cake. Then he opened his presents. I got him the First Season of "The Big Bang Theory", the video game "God of War II" and a pair of pants. Oh, and a new Sudoku book. Then I made Tyler's favorite dinner. Hamburger Pie. He was in heaven! Next we went to see the new Transformers movie. Tyler had been dying to see it. From the day it came out on the 24th, to when we saw it on the 30th I think he asked me about 10 times if we could go see it. He loved it. I liked it too, although I think I liked the first one more. After the movie we had Jalene and Greg over to help us celebrate with cake and ice-cream. It was a great day, and Tyler said he felt very spoiled. This was Tyler's 3rd birthday I have celebrated with him. The first one was only a few days after our first date and he was out of town so I got away with just leaving him a phone message. Last year Tyler started working a new job on this birthday so we just went out to dinner and a movie. It was great this year to be able to spend the whole day together doing whatever we wanted. We felt like little kids enjoying summer! I'm so glad to have Tyler in my life. He's the best, most patient, caring man ever. He makes me laugh more than anyone I know and he understands me perfectly. He's so helpful, infact he's making dinner all by himself this very instant, so I better go help too. But I love you, babe! Happy 24th Birthday! Aw, that is cute! Tyler is a good guy, I'm glad that you found someone who is deserving of you and your goodness, Linds! Love you!